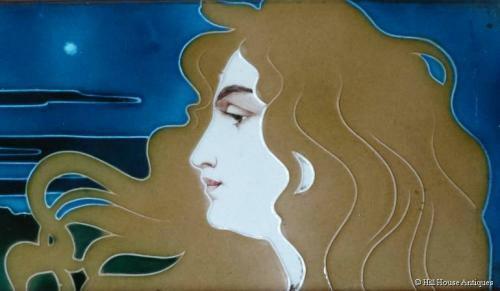 A superb example of an Art Nouveau large tube-lined tile of a stylish Art Nouveau period maiden profile in a night sky setting by Johann von Schwarz of Nuremberg, and designed by Carl Sigmund Luber (1868-1934). Approx 13.73" by 4.4" visible tile area; 17.5" by 8" overall including recent frame. PS excuse the angled shots!